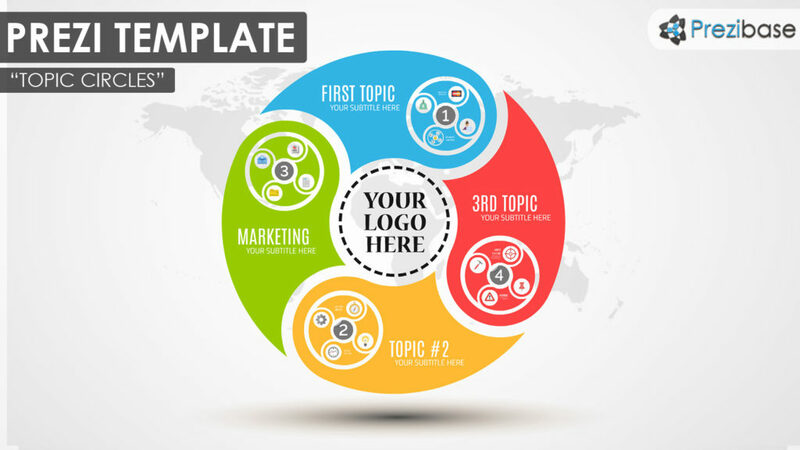 A multipurpose circular and colorful Prezi Presentation Template with a world map background. Use different circles for each topic and zoom in for the subtopics and content. Create an infographic overview, use it as a diagram or chart template. 4 different colors included and 1 circle with all 4 colors in one element. Customize for your own topic and use the Prezi built-in icons library. Present your ideas colorfully and professionally with a simple template. Use it for a business or personal presentation. Creative layout with lots of zooming options. This entry was posted in Best Prezi presentation templates and tagged blue, business circle presentation, circle, circle colorful, circle diagram, circle infographic, circles, circular, colorful, colorful circle layout, creative, diagram, green, infographic circle, infographics, layout circle, pie diagram, prezi template, prezi templates, red, Sphere, statistics, world, world map, yellow.